I love my inspiration board for my Master Bedroom makeover, and I love all the fabrics and colors that I bought, but this isn't working. Looks great on paper, not so much in reality. I've ordered a white comforter and found some fabulous fabrics, totally ready to do a makeover that I thought was going to be gorgeous. I started to sew some of the pillows, then decided I should do a mockup to see how it was all going to look. Love all of these fabrics, really pretty patterns and colors, but they really don't look good in this room. Remember, this is my Inspiration Board. I had a white blanket, so I put that on the bed and then started laying fabrics out. I'd already made the banana leaf lumbar pillow and I will use that somewhere, then I started to work on the two peacock pillows. I put the cording around one of them before I decided to do a test run. I bought a latice fabric to use with this grouping too. Great fabrics, just not with my headboard. It might still be a save if I use white behind the peacock fabric. I had a piece of off white fabric, so I put it across the pillows. No this is not going to work either. I've used all kinds of colors in here in the past, but this is just not a winner. One thing I have learned is to stop now and don't keep on and try to force it. Anybody want a couple of peacock fabric cut out pillow covers? Back to the fabric store. I agree, it didn't work. I think the patterns all conflicted with each other. I know you love the banana leaf fabric but I think that peacock fabric is beautiful! If I remember correctly you changed the headboard fabric when you bought it. Is it possible for you to apply a new fabric to the headboard to lighten that area up and maybe this would work? I really like what you started- the patterns are great! Move your orange/blue/brown pillow to the bed to try them. I bet it would work beautifully. You need a fabric that has a touch of brown in it to calm the headboard. I totally identified with your post, Marty. I just had to rip up a bathroom floor that went as wrong as wrong could go--looked great on paper, but in person, it looked like I'd smudged whole areas of the tile with black ink. As for your room, I do love your fabrics and inspiration board. I agree with Katz's suggestion, too. 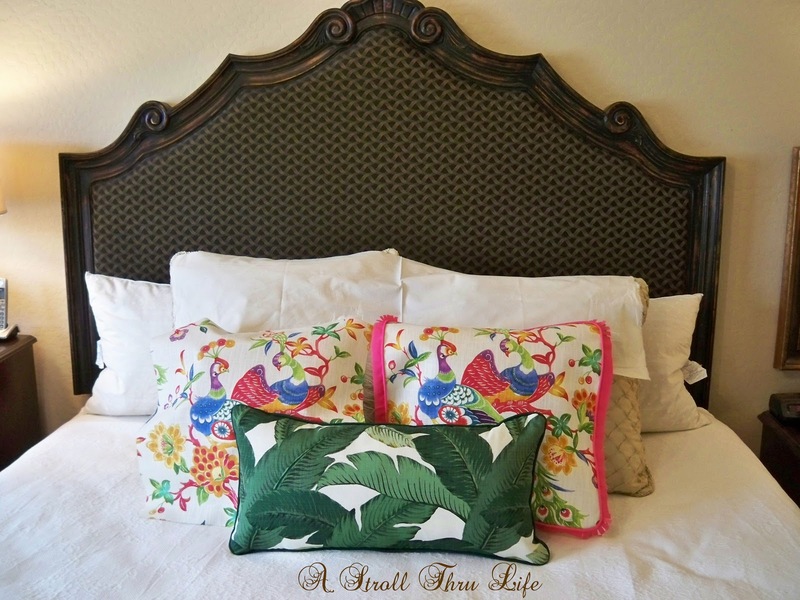 Also, would it be possible to use the peacock fabric in another part of the room--pillows, seat cover, even a cover for books--or in the bathroom? Have a great weekend! Those are such beautiful fabrics. Sad they do not want to play nice together. I know you will come up with a solution, that is one thing that is so much fun about following you. I love the Peacock pillows, the colors look more springy...I would relocate the darker green banana leaf pillows. Sometimes we're in sort of a disappointment when something that looked so perfect on paper doesn't even reflect the idea we had, lol! The Peacock pillow is awesome! You will find just the perfect ones soon. Agh! I don't know if my last comment was lost. Yes, remember when I thought I HAD to have Schumacher chiang ming dragon in the living room? I actually made the pillows. Oh I still dearly love that fabric but it was wrong, all wrong! Maybe we should have a linky party of nice things that didn't turn out and swap. 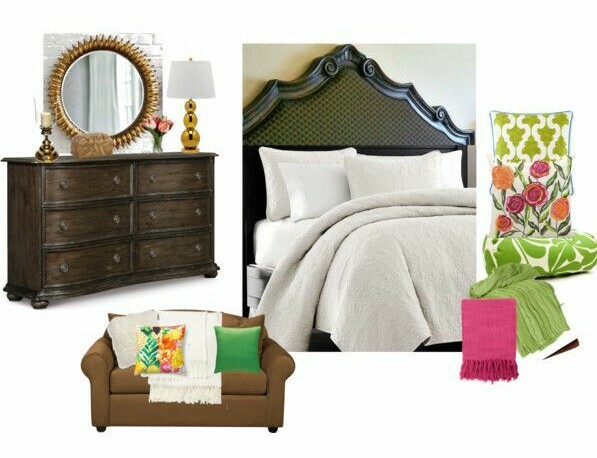 :) Anyhoo, agree with everyone, the headboard would need to be lighter. Love the peacock and lattice fabrics together. They are warm greens. The palm print is a cool green which is why it is fighting. But it could look nice in another area. I know you love a good challenge. I like the Palm Beach fabrics. It might be wise to change the headboard fabric. I like the trellis and the peacock fabrics together, maybe the oblong pillow would look nice repeated in the trellis fabric and maybe trimmed with pink or orange piping to tie everything together, and save the bamboo leaf fabric for another project...love the bright colors! 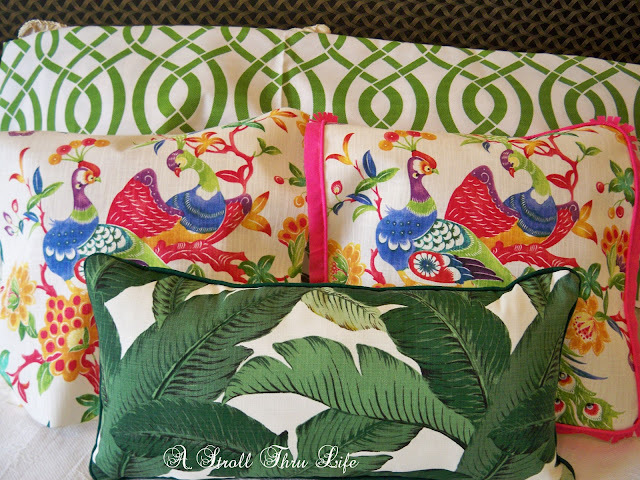 I do like the colorful pillows, and love that you use your blog to feel out how things look. Hope you find a way to make them work somehow. Thanks for sharing at Snickerdoodle. ahh shucks.. sorry it isnt working for you Marty... the greens are Beautiful though. I'd sure keep those~! I think the banana leaf fabric is the one that is not working. It is an off color from the other fabrics. 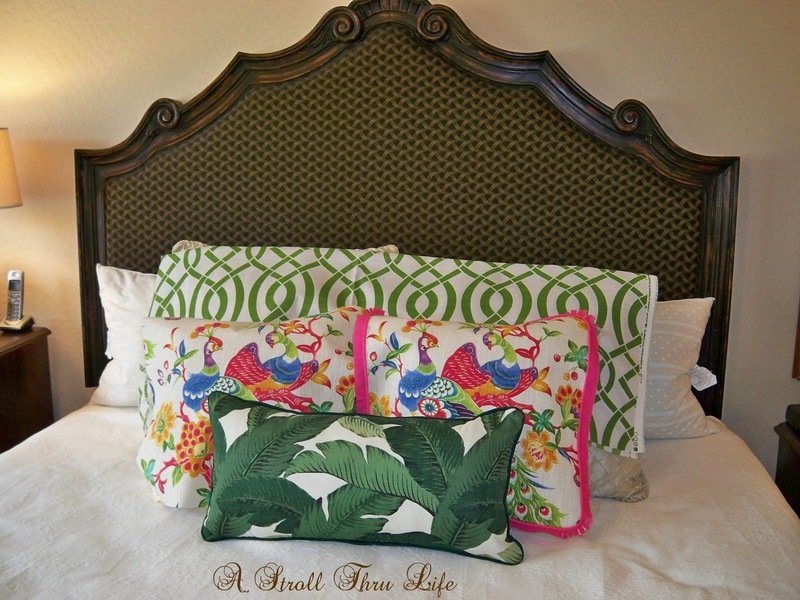 Also you might want to try a solid color pillow between the trellis and peacock fabric or I think if you paired your pillows (minus the banana leaf one) with a more colorful duvet it would work better. Perhaps something in a blue (navy or a blue-green) without a lot of pattern but maybe with some texture. Just a thought. Or if you are wanting more neutral and light colored bedding a nice tan would work better than the white. You'll figure it out, Marty! Good idea to stop where you were and test out the look. You saved yourself a lot more time doing that and can now "reboot". love the fabrics but agree not the right feel for the bad. I think the lumbar could stay, maybe a bit darker of a jungle type feel for the rest of the fabric with minimal bright colors? Or some big bold colors instead of prints? now you made me want to play around with fabric and my bedroom! I like the colors in all three fabrics but I agree that they don't work together. To my eye, it's because they are all large prints. I think if you swapped one of them out for a smaller print pattern it would go together better. Oh that's disappointing! I'm sure you will find an alternative.